My neighbor has a GE Aurora Clothes Dryer that ‘stopped working’. The reports were that the Start Button was becoming increasingly finicky. My gut reaction was that the physical switch was going bad. Well, in the end I was wrong about that, learned how not to design a dryer and gained even more appreciation for my 3D Printer. Check out this panel-view, it appears from the outside that this is some sort of membrane switch. I later learned that that is not the case. 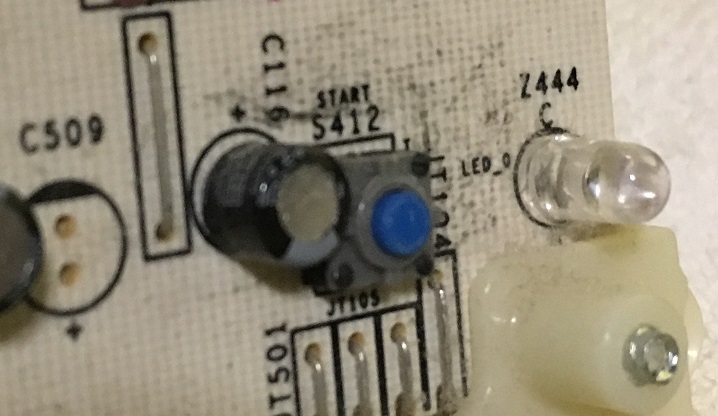 After removing the panel and PCB control board, I found an outer membrane, which pushed on an injection-molded button with an inch-long pin and that pin pushed on a tactile switch that was soldered to the PCB control board. Yeah, it sure is a wacky design and it’s almost shocking that this worked at all. But anyways, the original button/button-pin was all bent out of shape and would not contact the tactile switch when pushed. All I had to do was figure out how to keep the button-pin centered over the tactile switch. 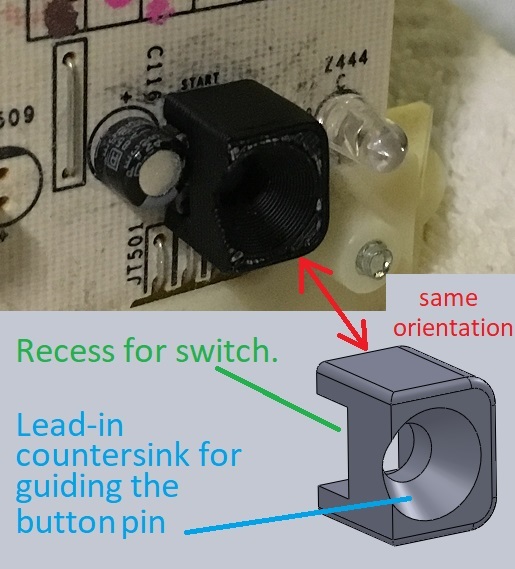 Tactile Switch that the Button-Pin has to press. It’s a small target! So this is where the 3D Printer comes in. I took a few quick measurements of the switch and surrounding areas (notice the capacitor jammed right up next to the tactile switch). After a few minutes drawing up a button-pin guide, I started printing a copy. The print only took 6 minutes! I walked back over to my neighbor’s house with the printed part and some crazy glue. The part glued onto the control board PCB without issue. 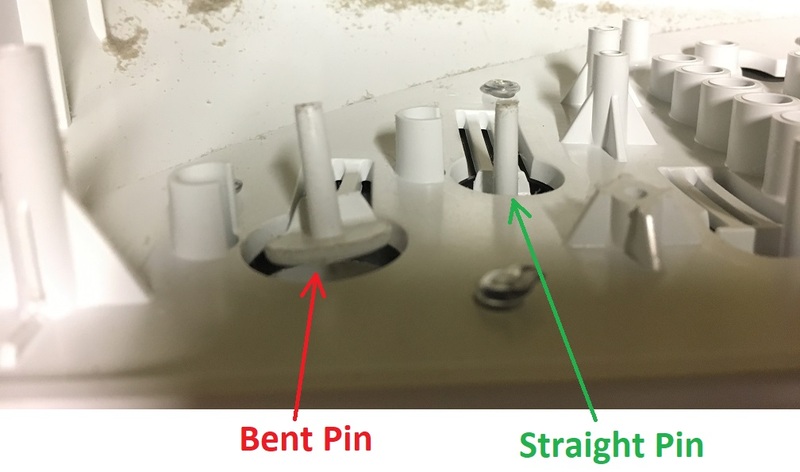 However, even though the center hole in my guide was plenty large, there was still some friction because the pin was bent so much. I could press the button in, but it wouldn’t pop back off of the tactile switch by itself. So, I installed a spare spring around the button-pin and that that was that. Poorly-lit photo of the Button-Pin Guide installed. This entry was posted in Projects and tagged 3D Printer, 3d printing, GE Dryer, GE Dryer Start Button by Bremster. Bookmark the permalink.